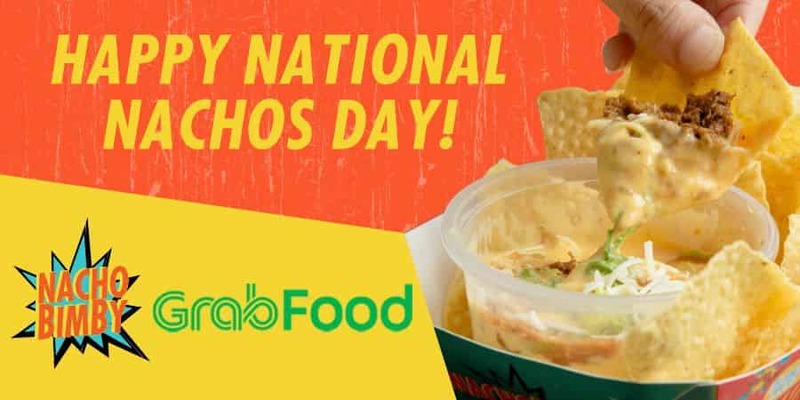 Celebrate National Nachos Day with GrabFood and Nacho Bimby! Treat yourself with this classic crowd pleaser — Nachos. This November 6, GrabFood and Nacho Bimby celebrate the National Nachos Day. Exclusive only for orders made via GrabFood, eaters from Metro Manila get to enjoy a Buy One Get One deal from Nacho Bimby! Choose from Killer Keso, Senorita Salsa, Labimbeef and Lucha Chix to satisfy your craving! Buy any Nachos (Supremo or Ultimo) to get another Nachos (Supremo or Ultimo) of same flavor and of equal value for free. Promo is valid only for orders made thru GrabFood. There is no limit on the number of orders for the Buy One Get One promo in every single-receipt purchase. Promo is not valid with other discounts or promos.